Up until a few years ago, space largely fell within the realm of a few major aero defense groups and government agencies. No one in their right mind, save for a few individuals that fit the “eccentric billionaire” archetype would even consider making investments in this “space.” However, the tides have turned. A recent report by the Tauri Group counted over fifty venture firms that have invested a collective $1.8 billion dollars in space startups last year. That’s double the total amount invested over the past 15 years combined. And while we’re hearing a lot of the same names- SpaceX, Blue Origin, Virgin- in the media, round A funding seems to be happening frequently, and on a global scale. Yet, this influx of excitement and investment follows a long human absence from space. The Columbia tragedy led to a suspension of NASA’s space shuttle program, and with the exception of the International Space Station, our presence off the blue planet has been limited at best. NASA has had to reinvent itself in the midst of the great recession in order to advance in any meaningful way, and has since been looking to the private sector for resources. NASA’s investment in the commercial space sector allows the agency to cut costs without sacrificing access to new technologies- enabling a renewed focus on deep space exploration particularly as private companies begin entering near-Earth orbit in droves.Still the U.S. is waiting to once again have its own launch platforms-having its own launch platforms, and is eager to move away from bumming rides to the ISS from Russia. “Had [the Commercial Crew Development Program] been fully funded, we would have returned American human spaceflight launches — and the jobs they support — back to the United States next year. With the reduced level of funding approved by Congress, we’re now looking at launching from U.S. soil in 2017,” says Charles Bolden, NASA administrator. 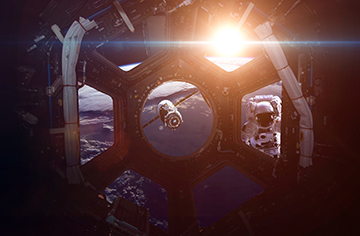 “By 2030, up to 10 percent of the world’s gross domestic product could be linked to space in some way,” says Dylan Taylor, global COO of Colliers International. Even technology spin-offs with futuristic implications like microgravity experiments, or R&D dedicated to more “moonshot” level space missions like colonization or mining, are becoming worth the investment. Over the last 50 years, NASA has developed a considerable amount of technologies for non-space applications spanning everything from medical devices to materials and military advancements. As it currently stands, industries from consumer electronics to precision agriculture have some hand in the space race. Over the past few years, NASA has put out several calls for proposals to compete for partnerships with the space agency. These projects, available to big aerospace and small startups alike, are aimed at developing these symbiotic relationships; participants receive grants to mature new technologies, and NASA can access that technology, without having to fund the initial R&D stages. The NASA proposals are just one example of the new partnering structures slowly taking over space- but their beginning to create a major shift in the way private investors are viewing the risk-reward time frame within the industry. Though space investment is on the rise, with business models changing rapidly, IPO exits are few and far between for the time being. It’s only when we enter the next phase that we’ll see more money coming in from corporate investors. Now that we’ve more or less taken down the giant wall to space, the next stages of the space economy will see more restructuring as it continues to evolve. Older satellite manufacturers and launch service providers must quickly adapt to the changing environment if they want to compete. Don’t miss the upcoming SPACE 2.0, April 25-27, 2017 in Silicon Valley, where you’ll be able to forge strong industry relationships and get the latest on identifying ways to profit from NewSpace and big data! Click here for more info on the cutting-edge event.